I'm still going through sketches from this past summer, and I see others are too! 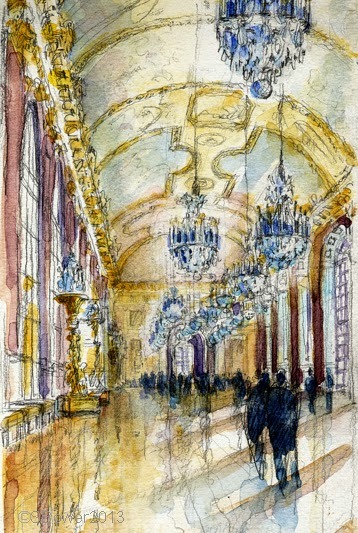 It took weeks to get the letter--special permission to sketch inside the château of Versailles! In late July, I battled the massive crowds and made my way up to...that's right, you guessed it...the Hall of Mirrors...straight to the most difficult but most iconic space to draw. I showed my letter to the guard, who read it many times and made several phone calls until finally, her boss arrived. She granted me permission to set up my sketching stool INSIDE the cordoned off area at the end of the hall. So feeling very self-conscious, I climbed over the barrier, sat down, looked up, and felt totally overwhelmed. It took a long time to do these sketches, and it was so fatiguing, my brain was mush by the end of the day...but I loved the challenge. There was just so much visual information (very hard to figure out how to edit), not to mention the many hundreds of people passing by my right ear. Of course I couldn't pull out my paints (can't get watercolor on the silk! ), so the sketches were painted later. Versailles, France. Galerie des Glaces. I was grateful to get special permission to draw inside the château. Versailles, Galerie des Glace, detail. Thanks, Anita--can't wait to see what you are doing in Italy, I'm sure it's beautiful! Fabulous drawings! I was in Versailles many years ago, you've captured it beautifully!! Thank you, Jim! It was sure challenging to draw there, I'm glad you like how it turned out! What a great opportunity. Where did you get permission from? Beautiful! Versailles was one of my favorite places when we were there...We took a bike tour there. What a great opportunity to be able to sketch there. Stunning work! Thanks so much for sharing your sketches, Stephanie. They are stunning! You've really captured a sense of the vastness and sheer awe in the chateau. I always enjoy reading what you've written, also.